I've got this great idea to run a writers' retreat here in Vulcano. Part of the key to its success is that it could be done self catering, with restaurants as wanted, or with food from the amazing Sicilian takeaway joint up the road (Rosticceria Gastronomia le delizie di Ceraolo Venere, Via Mercalli), run by Pipo and Nerina, who close shop for the season on Sunday. I was lucky to make it here before they closed this year ...I'm not having to spend time cooking but I'm still eating like a king. 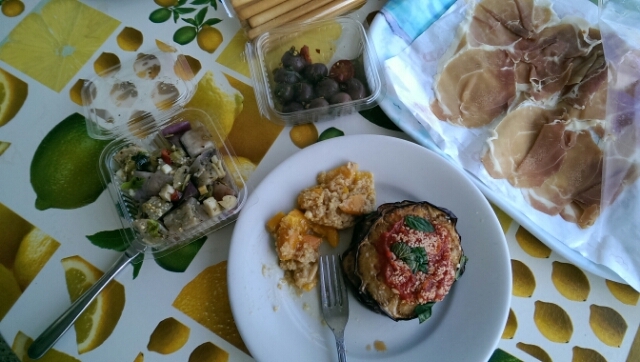 Eggplant medallions with roasted peppers for lunch, baked zucchini with some kind of mixed vegetables for dinner, all for €11/£8/$12. And I'm not having to spend time cooking and cleaning. Excellent!